Sometime in ’98, Fall if I remember correctly, I bought one of those ‘Back to School’ cleaning kits containing several products at an irresistible price. I had moved into a new apartment and wanted to give it a good old fashioned going over before I really unpacked and moved in. Thing is, almost as soon as I got started, I noticed a tightening in my chest. Oddly enough, I didn’t pay much attention to the burning throat and decreasing ability to breathe. I simply opened the bathroom window, finished and rinsed the shower, skipped dinner and went to bed. It wasn’t until I ran into someone with severe environmental allergies some significant stretch later that I revisited the earlier life-altering experience. I won’t tell you exactly how much time passed between events because I don’t want my Suzy Homemaker badge revoked. Suffice it to say, I switched to vinegar diluted in water until I gave up cleaning altogether. 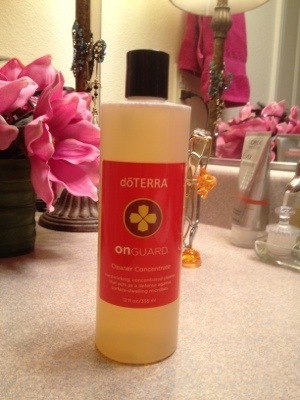 Fast-forward to this morning and my joy at receiving DoTerra’s On Guard Cleaning Concentrate. I dropped hubby off, had a satisfying 15 minutes on the rowing machine and a sweaty 35 on the elliptical. Met a friend for lunch. Had the awesome favorite Avgolemono Soup at the Greek Grill and an even better chat on everything from paradigm-shifting to rhizome theory, creativity as a lifestyle and presencing. When invited to spend the afternoon reading by this dear friend’s pool, I surprised us both opting instead to wash the kitchen floor with my new human-friendly cleansing liquid made of clove oil, wild orange and other organic aromatics. Weird huh? Fact is I’ve been waiting and preparing for this moment for some time – the better part of a year in fact. Now before you run off thinking, “she’s really not the brightest bulb in the socket after all,” let me remind you, I lived to write this post. In any case, because DoTerra’s entire line is made from 100% certified pure, therapeutic grade essential oils, not even the slightest side-effect was felt. And that’s what I’m thrilled to report. Cleaning is once again a moving meditation option for me.